A judge on Wednesday ordered Peru’s opposition leader, Keiko Fujimori, returned to jail pending a trial over allegations she used her conservative party to launder money for Brazilian construction company Odebrecht . Fujimori, 43, spent a week in police custody earlier this month before being released on appeal. 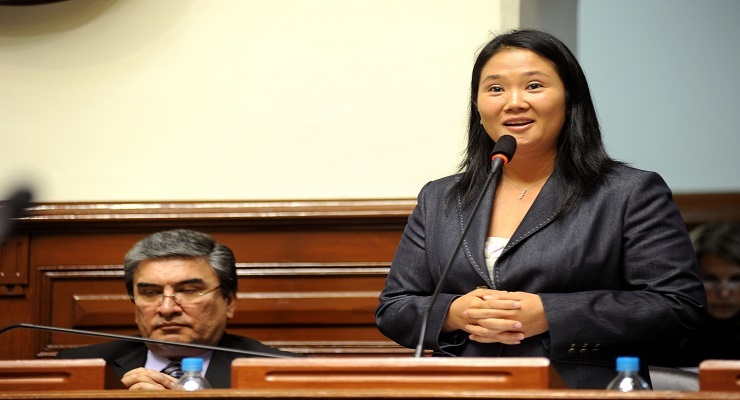 But Judge Richard Concepcion of the National Criminal Court on Wednesday ruled Fujimori and her associates had sought to obstruct the Odebrecht probe, and granted prosecutors’ request to jail her for up to three years to ensure they could work freely. “Preventive prison,” or pre-trial detention, is common in Peru, though critics say it is used excessively. Fujimori’s attorney told the court she would appeal. Dressed in black with her hair in a ponytail, Fujimori hugged her husband and appeared to be holding back tears. “We hope this arbitrary and disproportionate decision can be corrected,” Ursula Letona, a lawmaker in Fujimori’s Popular Force party, said on broadcaster ATV+. Clashes between dozens of Fujimori’s supporters, her critics and police erupted outside the courtroom after the decision was announced, according to images on TV channel Canal N.
Fujimori’s legal woes have crippled her once-powerful party – potentially ending the political turmoil that has loomed since the 2016 elections over the world’s No. 2 copper producer and one of Latin America’s most stable economies. Popular Force used the congressional majority it won in 2016 to help topple former president Pedro Pablo Kuczynski in March, and had recently been turning up the pressure on his successor, President Martin Vizcarra. But as the prosecution last week detailed its evidence against Fujimori in a widely-watched hearing, Popular Force called for an end to the “political war.” The party’s top leaders – except Fujimori – have stepped down, internal divisions have erupted publicly and one Popular Force lawmaker admitted he was an informant for prosecutors. Vizcarra has ignored public pleas from Popular Force representatives for a private meeting with him to discuss legislation. Prosecutors accuse Fujimori and her associates of laundering US$1.2 million for Odebrecht, which has admitted to bribing politicians across Latin America. After Brazil, Peru is the country where the Odebrecht scandal has been most disruptive – fuelling the kind of anger at political elites that helped propel radical former Army captain Jair Bolsonaro to Brazil’s presidency. Fujimori denies ever taking money from Odebrecht. Three years in jail would put Fujimori out of the 2021 presidential race – though she would have the right to run a campaign from prison if she still has no convictions. But Fujimori may be released on appeal before then. In early October, a separate court revoked a pardon that had freed Alberto Fujimori from prison for human rights crimes during his 1990-2000 government. He has been in hospital since the ruling. In April, Peru’s Constitutional Court in April also freed former president Ollanta Humala halfway through the 18 months he was ordered to spend in jail before trial, finding it had violated due process.